Babywearing has been around since the time of our ancestors. The practice makes transporting our little one more comfortable and freeing our hands to attend other duties in the house. Not only that, there is more benefit of babywearing to you and your baby. The babywearing practice has grown fast in the modern world, and hundreds of babywearing products have emerged on the market confusing to parents on what is right and wrong. However, like any other product, it can pose a danger if not used correctly. We have shared various Babywearing safety tips that you should remember before stepping out with any carrier. The rule is the safety checklist devised by the UK Sling Manufacturers & Retailers Consortium. Suffocation can occur very fast if the baby airway (nose and mouth) is pressed on the adult body can cause suffocation as this position blocks airflow and restrict oxygen supply. Premature babies, underweight, babies with breathing or respiratory problem and younger than four months are at high risk of suffocation. To protect suffocation ensure the baby upright or vertical position when babywearing is making sure the face is visible and high enough to monitor breathing. Also, make sure the baby chin is off her chest or not tucked. It is recommended that infant should be held horizontal or cradle while breastfeeding and return to upright or vertical position when done. The position helps reduce the risk of suffocation. You should always frequently check the baby when in any carrier to make sure the airway is open; baby head close enough to kiss, the chin is not touching chest, the face is off carrier fabric and caregiver body. Never involved in vigorous activities when carrying the baby in any babywearing product. Vigorous activities include run, jog or jump. Vigorous shaking can cause damage baby neck, spine, swelling and bleeding in the brain mostly to small babies leading to blindness, death or other disabilities. It can also lead to the shaken baby syndrome. Front carry when the baby is facing inwards –the position is excellent for infant four months and below. During the first four months, the baby’s neck and the head are not fully developed and need full support from the caregiver. 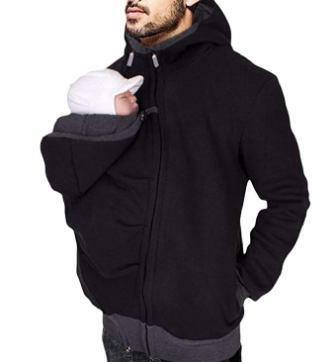 Front carry when the baby is facing outwards- the position is best for babies past four months who have fully developed the neck and head muscles. The baby can look out the world while still close to mom’s womb. Back carry- the baby position at your back. The chest will be against your back and will see what you see. 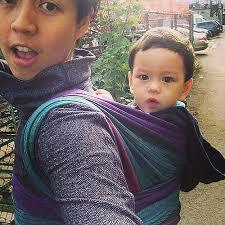 There are different types of babywearing products. Parents have the choice to choose what you’re comfortable. There are varieties of babywearing products parents should choose but whatever the choice determine which one fits you comfortable and remember baby safety comes first. Infant neck and back should be supported until the muscles are fully developed and can move the head freely. You should not carry the infant front-outward position until they have full control of neck and head. The baby can slip out when you bend because the position you have held the baby might change. If you must bend start with your kneel and make sure you held the baby carefully and stood carefully making sure the baby is in the right position. When you wash any babywearing product seams, buckle or harness may wear out make sure all the parts are safe and placed correctly. Always make sure you inspect baby carrier/ sling/wrap when buying to ensure it is not damaged and make sure it meets all babywearing safety standard. Practice makes perfect. Take time to learn how to baby wearing if you are new to the practice until you are good at it and comfortable before you step out. You can use dolls to practice or doing at home before traveling with your baby. Double check your work or you can ask experience baby wearer to supervise whether you have done correctly. When you are sick, you are more prone to dizziness which may lead falling to some people injuring your little ones. Put on the shoes that you are comfortable with when babywearing. You can consider wearing a flat or wedge shoes. So know yourself and choose the right shoes to walk with stable feet. While walking pay attention to where you are stepping pavement might have holes or crack that could quickly make you fall. Other walking ways might be slippery especially if the rainy day and this could lead to a fall. Carriers/sling/wraps should not be used as a floating device; you should not wear your baby when swimming, moving cars (you should use car seat instead), when riding on cars or bicycles. Don’t wear the baby when attending activities which can cause injury to your child. Such activities include cooking (most fabric that makes the product are not flame resistant so they can catch fire easily), taking the hot liquid and when using sharp objects keep distance. After buying your babywearing products reads manufacturer safety precaution and follow them strictly. Ask for help if you have difficulty in placing or removing your child in any babywearing product. By paying attention to above babywearing safety tips, you could prevent you and your baby to danger caused to improper use of babywearing products. Before you start babywearing always familiarize yourself with basic babywearing safety guidelines. I am sure there are other babywearing safety tips that I have might forget. Feel free to add in the comment section below.